Recommended for brittle and fragile hair, this shampoo softens and nourishes dry hair. We have selected the precious French mirabelle seed oil for its numerous properties. Cold pressed mirabelle oil is naturally rich in unsaturated fatty acid (omega-9 & omega-6), sterol and tocopherol. The properties of the mirabelle oil associated with aloe vera make this shampoo intensely nourishing. It protects and helps repair damaged hair, nourishes and revitalizes the scalp for healthier hair, shine and improved manageability. 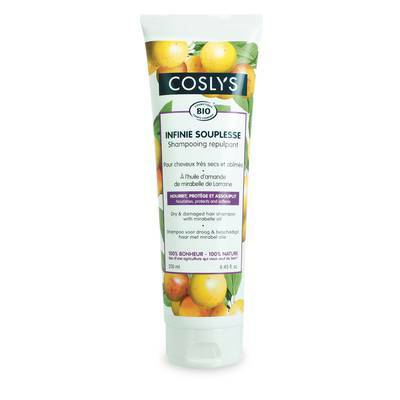 Coslys shampoo with mirabelle oil leaves a lingering light sunny scent in your hair.